John Adam was a student at the Ballarat School of Mines (SMB) from 1901 to 1903, he then lectured for two years at his old school. According to the SMB Students' Magazine Jack Adam was appointed to Professor Dawbin as his assistant in 1903 in 'dispensing mineralogy, geology, to the embryo scientists'. Working alongside him was Mr J. McFeeters who assisted Mr Hart. Adam was the business manager of the SMB Students' Magazine, sub-editor (geology) in 1904, and editor (1905). When the balance sheet was presented by the treasurer the financial position of the magazine was 'very satisfactory'. When Professor Dawbin to whom Adam was apprenticed, was on twelve months leave, Adam became assistant to both R. W. Hawkins and Professor Hart. John Adam passed Land Surveying (Grade 2) examination and practical in June 1904. He graduated in 1905 and secured a position under Messers Bewick, Moreing and Co at Moorloort, Victoria. Adam became a leader in Australia's silver, lead and zinc industry. He was the Super intendant of 'Sons of Gwalia', and headed other organisations such as Zinc Corp in Broken Hill. Adam became friends with Herbert Hoover when Hoover oversaw the development of the Sons of Gwalia mine near Leonora in 1897 and 1898. Jack Adam would later visit his friend, the President of the United States of America, at the White House. John Adam's protégé's included Sir Maurie Mawby (Conzinc Rio Tinto of Australia) and Sir George Fisher (Mount Isa Mines). Jack Adam came from an engineering family. His father, John, was a civil engineer with responsibility for a number of railway bridges in Victoria. Joseph Smith, the first Victorian Government Mining Surveyor, was Adam's uncle. John Adam's sister. Elizabeth, married Oliver Smith, also a Government Mining Surveyor. John Adam died on 10 April 1955 at 'Daisyleigh', Beckworth. 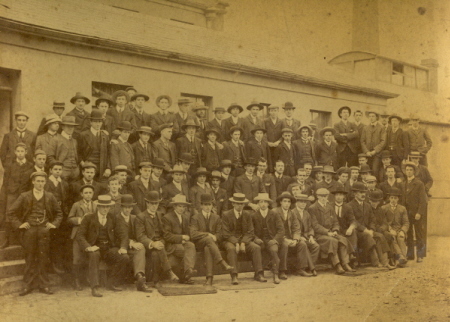 Image Caption (RHS): A group of SMB Students, c1900. Image Caption (LHS): SMB Magazine Committee, 1905. 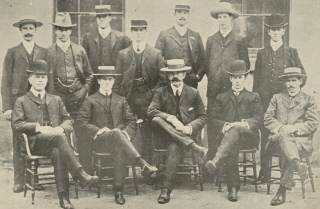 Standing l-R: E.J.McConnon (Mining Engineering); C. Macginnis (Hon. Treasurer); S. Hepburn (Hon. Treasurer); G. Evans (Metallurgy); William Figgis (Geology & Sports Editor); J. Grant (Electricity); G.V. Anderson (Chemistry).